BOLOGNA--You grind the meat twice, then fold in cubes of pork fat, whole pistachios, and peppercorns (maybe some myrtle berries, if they're handy). shape the mix into a chubby loaf, five pounds minimum. Boil or steam; chill, slice very fine. This is the signature sausage of Bologna, known around the world as mortadella, but, thanks to Oscar Mayer, usually referred to in the USA as "Bologna" and pronounced, alas, "baloney." The recipe has been around since ancient times. The "morta" may refer to a mortaio (mortar), or to the mirto (myrtle) berries used as a flavoring before pepper became available. 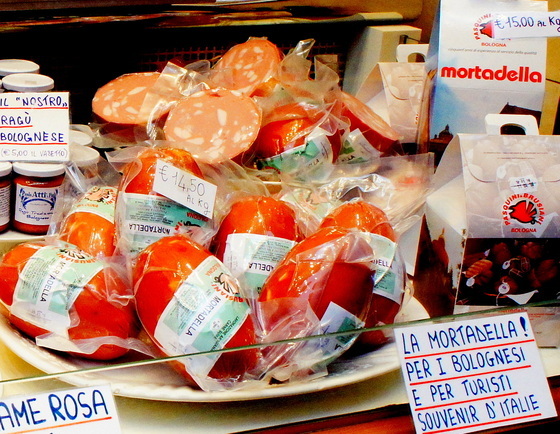 In any event, mortadella is everywhere, and (compared to many fine foods) not particularly expensive: about $8 a pound. Prosciutto, for example, is several times that, no doubt because it has to be cured and aged for several years in ideal conditions (the cold, damp hills of the Apennines). Mortadella, made with scraps, takes no time at all. On a plate of cold cuts, or between two slices of bread, it makes a quick meal. One more thing. In the early 1960s, you couldn't bring mortadella into the US because there had been an outbreak of swine flu in Europe. The ban became the plot device for a silly comedy called "La Mortadella" starring Sophia Loren. Eventually the ban was lifted, Miss Loren went on to a brilliant career, and mortadella was restored to its proper position in the firmanent. Even so, the producers decided no one in American knew from mortadella, so they changed the title to "Lady Liberty." Che vergogna! This page contains a single entry by Cornichon published on February 8, 2016 9:00 AM. Only in Venice: Soggy Carnival was the previous entry in this blog. Only in Italy: the Scontrino is the next entry in this blog.